In designing the Contrail, we set out to create the perfect traveler's watch that combines the toughness of a diver and the functionality of a GMT. We also wanted to make the perfect sport watch case that had enough flare to dress up but enough utility to stand up to the elements. One of the main inspirations for the Contrail was one of our favorite watches of all time, the Sinn 104. In our research, we’ve seen the 104 referred to as a pilot, a diver, or as it says on their website, an “instrument” watch. While the 104 is officially deemed an “instrument watch”, its 200m water resistance suggests that it was designed with water-resistance in mind, perhaps even originally intended to be a diver. 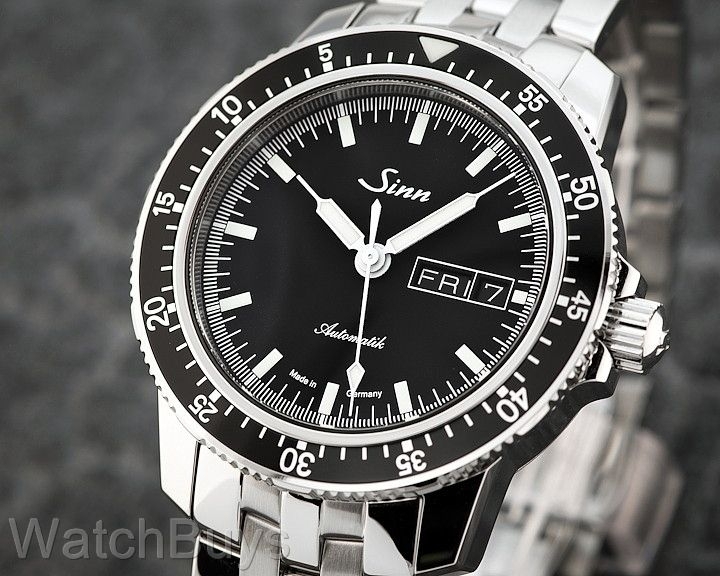 The Sinn 104 has a slim case with beautiful wide lugs. Originally designed as a traditional diver, the Omega Seamaster 300 "Spectre" edition was released as part of promotion for the film, Spectre, starring Daniel Craig. Other watches that we looked at for inspiration were the Omega Seamaster 300 “Spectre”, Seiko SARB033/035, and the Rolex Explorer I. Rather than debate semantics, this blog post will focus mainly on the design choices that we made for the Contrail. Our take on baton hands: they taper ever-so-slightly from the base to a point at the ends. The pilot-style seconds hand just seemed to fit right in. One of the most important aspects of a tool watch is easy determination of orientation. While the two-piece index at 12 o’clock adds a cool dynamic to the dial, it also serves a functional purpose. Visibility and readability were the main goals when we were designing this dial. We decided to include a date-complication due to its importance to the frequent traveler. The texture on the dial adds a little bit of activity to an otherwise minimalist dial. To add even more depth to the dial, the rehaut and outer ring were added to add some contrast between the dial and the outer bezel. The minute and hour hands are our take on baton-style hands, which start slightly wider at the base and narrows toward the tip. The seconds hand is reminiscent of more traditional pilot watches, with printed lume at the tip for nighttime visibility. The knurled bezel grip is not visible when looking straight-on at the watch. The case has a slight bowl shape to it, which helps take some heft away from the watch. For us, the proportions of the case would either make or break the entire design, so we had to get them perfect. We wanted bold and meaty lugs, but with enough curvature to strike an attractive balance between masculinity and femininity. The crown guards, a first for Nodus, provide protection to the crown but are integrated so that crown operation is largely uninhibited. With a lug-to-lug length of 47mm and thickness under 12mm, the Contrail was designed to be easily wearable, with not too much heft on the wrist. As with all of our watches, there are also drilled-through lugs for easy strap changes. A proper bi-directional GMT bezel is something we’ve wanted to do for a while. A 12-hour GMT bezel allows us to maintain the simplicity of the insert and is more straightforward to use than a 24-hour bezel with a GMT movement. Given the modern feel of the watch, we decided to go with a sapphire insert to accentuate the contemporary styling, as well as to add an extra dimension of elegance. On the Contrail 39, we decided to brush the fixed bezel in a sunburst pattern as we love the way it captures the light. There is a polished chamfer on the inside circumference of the bezel to frame and highlight the diall, and the outside edge of the bezel is also polished in order to create a more interesting distinction between the bezel and case. The crown features knurling for easy grippage and an attractive polished “button top”. A new feature we have engineered with the Contrail is a decoupling crown. A decoupling crown disengages from the movement while screwing down, which bypasses handwinding and allows for a superbly smooth screw-down feeling. The knurled grip on the crown matches the bezel grip. The crown also has a decoupling mechanism inside to ensure smooth action when tightening. The H-link bracelet is known for its modern look and superb comfort. The H-link style bracelet has come to be one of our favorite styles of bracelet. The construction of the bracelet allows it to be quite flexible and extremely comfortable. It also has a cool “modern retro" look to it. The clasp we decided to go with has both a button-release mechanism and a flip-lock for extra security, as well as six micro-adjustment holes for extra convenience. Last but not least, the clasp is made from solid milled steel rather than stamped steel, for a high-quality feel. Nodus' goal has always been to create utility-focused watches that look just as pretty on the wrist. While the Contrail doesn’t fit neatly into any pre-existing “category” of watch, it was designed with a specific purpose in mind: to be the perfect tool for a frequent traveler who needs to keep tabs on what goes on at home. I think with the Contrail, we have achieved that.